Join me for live election night coverage of races affecting the state courts including the ballot item discussed and examined by Gavel to Gavel as well as state supreme court races from across the country. Coverage starts at November 3 at 7 PM Eastern at www.ncsc.org/elections. Wisconsin Question 1: How are chief justices picked in other states? Court Selection: presently in place in 22 states covering 23 courts if last resort (Oklahoma Supreme Court + Court of Criminal Appeals). Gubernatorial Appointment: 12 states/12 courts. Seen most often in New England states, this typically includes Senate or House and Senate confirmation. Partisan or Non-partisan election: 7 states covering 8 courts (Texas Supreme Court + Court of Criminal Appeals). In these cases the person is running for the specific office of Chief Justice and not simply to be a member of the court. 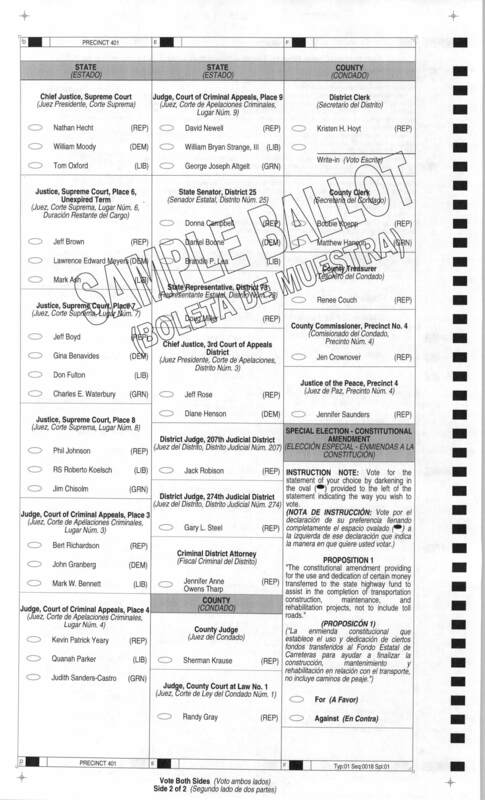 For example in 2014 when Texas Chief Justice Nathan Hecht ran for re-election, it was to the office of Chief Justice as seen on this sample ballot. Seniority: 7 states/7 courts. “Strict” seniority such as in Wisconsin provides that the person longest serving on the court is chief justice. “Rotational” seniority such as in Nevada functions in a similar fashion, but requires the next-most-senior justice take over after 1 or 2 years. Legislative appointment: 1 state/1 court. More common in the earliest part of U.S. history, the only state that retains this practice is South Carolina. Other: 1 state/1 court. In Indiana, it is the Judicial Nominating Commission, without input from the governor, who selects the Chief Justice from among the already serving justices. This occurred most recently in 2014 when then-Chief Justice Brent Dickson went back to being Associate Justice Dickson and Loretta Rush was elevated to be chief justice. Continue reading Wisconsin Question 1: How are chief justices picked in other states? Posted on March 30, 2015 March 31, 2015 Author Bill RafteryCategories Election 2015, Selection1 Comment on Wisconsin Question 1: How are chief justices picked in other states? There may be other items in the fall of 2015, but for certain there will be one ballot item that will affect state courts this spring. Wisconsin Question 1, adopted by the state’s legislature twice (2013/2014 session and then again just a few weeks ago) would end the practice where the longest continuously serving member of the Wisconsin Supreme Court is chief justice and replace with a court-selects process. The justice having been longest a continuous member of said court, or in case 2 or more such justices shall have served for the same length of time, the justice whose term first expires, shall be the chief justice. The chief justice of the supreme court shall be elected for a term of 2 years by a majority of the justices then serving on the court. This week I’ll be looking at the subject of Question 1 in particular and the general question of what other states do, and have done, to pick chief justices.